The Jungle is calling upon you to unleash your wild side with the Jungle Spirit Call of the Wild slot. Deep in the heart of the jungle a thrilling adventure awaits. The slot not only helps you embrace your wild side but rewards you generously for doing so. There are multiple wild and fun features that’ll leave you belting out like Tarzan. 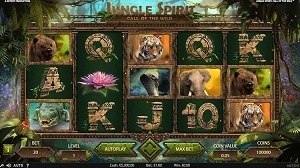 Jungle Spirit Call of the Wild is a 5 reels, 3 rows and 243 – 1,024 ways to win video slot powered by NetENT. The slot comes with beautiful graphics and a natural soundtrack with animal sounds filling the speakers. Combined, the graphics and sound effects transport you to a place untouched by human hands. Players can indulge in this adventure filled slot on all devices from desktop to mobile and tablets. Get wild from as little as 0.20 per spin to a more effective 100 per spin. The coin values range from a low 0.01 to a solid 1 per line. Depending on your coin value you’ll be able to fully embrace the call of the wild for hours on end. Jungle Spirit Call of the Wild is a favourite among players because of its big winning potential. It is a medium to high variance slot which means that winnings will be a whole lot more rewarding. If the theme alone doesn’t get you excited there is also the chance to win 7,678 times your stake. 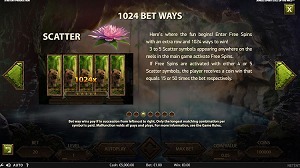 Jungle Spirit Call of the Wild is a feature rich slot that provides players with multiple winning opportunities. The base game provides players with a solid 243 ways to win. Once you enter the free spins feature this number will sky rocket to a massive 1.024 ways to win. The Symbol Expansion Feature can be activated in the base game as well as the free spins feature. In this feature all symbols apart from the scatter can be marked by glowing, animated butterflies. Any symbol marked by these majestic creatures and forms part of a winning combination will expand to cover an entire reel. The Symbol Expansion Feature can be especially rewarding during the free spins feature. During the main game the Butterfly Boost feature will activate at random times. If the butterflies grace you with their presence you are guaranteed a lucky win. The butterflies will fly around the reels and will expand between one and three symbols. They will only expand symbols that are guaranteed to create a winning combination. In this features lady luck will definitely be present and if you are lucky all three reels will form high value winning combinations. The free spins feature is activated when three or more scatter symbols appear anywhere on the reels during the base game. The more scatters trigger the free spins feature, the bigger your rewards will be. If you land four scatters you’ll trigger the free spins feature as well as a 15 times your stake bonus. And if Lady Luck is shining upon you and you have five scatters you’ll trigger the free spins as well as a 50 times your stake bonus. During the free spins feature there are 5 free spins animals to choose from. The chosen animal will be the dominant symbol in the feature as it will be the only symbol on the reels. Each animal is linked to a certain amount of free spins. The free spins round can’t be retriggered. If you choose to play with the mighty tiger you’ll receive four free spins. The giant elephant will award you with eight free spins and the wild bear 12 free spins. If you prefer a dance with the crocodile you’ll receive 16 free spins. And finally, those who dare to stare the cobra in the face will receive a solid 20 free spins. Although most will opt for higher amounts of free spins the animals linked to the lower amount of free spins are of more value. For instance if you have 5 tigers you’ll score 150 coins where 5 cobras only award 60 coins. Of all the creatures on earth, wild animals remain the most magical. They exude freedom, strength and something untouched by mankind. Animal themed slots have always been one of the most popular choices among gaming suppliers. 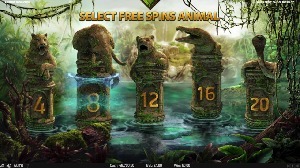 The Jungle Spirit Call of the Wild slot by NetENT features animals rarely seen on a daily basis. To look at these magnificent creatures you’d have to visit a zoo or explore the wild. If the animal theme is a little too much to bare why not try something more musical? NetENT has created a superb NetENT Rock Slot Series that include slots designed around musical legends. Get groovy with Jimi Hendrix or rock out to Motorhead for wild winnings. Mobile players will be able to partake in the wild adventure on all modern mobile and tablet devices. 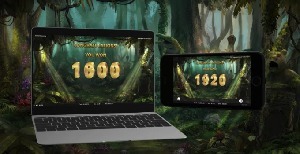 The game runs smoothly on all devices from small screens to big tablet or iPad screens. NetENT always ensures that the switch from desktop to mobile is an effortless one. With the high definition graphics and clear sounds you’ll be transported into the jungle on any device. There are barely any difference between the mobile and desktop version of the slot apart from the button placements. The HTML5 software guarantees that the mobile gameplay will be as enjoyable as on desktop if not even more. Calling all adventurers! 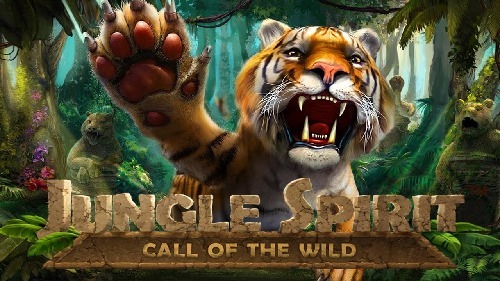 Experience a once in a lifetime journey on the Jungle Spirit Call of the Wild slot. As always NetENT has ensured that the slot comes to life on all devices to guarantee an unparalleled gaming experience. The slot comes with big wins of up to 1,825 times your stake during the base game. Winning doesn’t come cheap and the slot can be a little heavy on the bankroll.